How often have you been falling from an 80 story building after a death-defying leap of faith and thought, “I wish I had my action camera right now.” Remember the last time you and your friends were reminiscing about narrowly escaping that massive avalanche with a series of epic flips and shreds down the mountain and wish you had caught it all on camera? The worst instance and this happens to me often, is the missing camera when a pod of mermaids attacks my boat, deep in the Pacific Ocean because I’m fishing on their hunting grounds. We never seem to have our action cameras when we need them most! Accessory Genie is sick of the excuses for never catching these once in a lifetime shots. 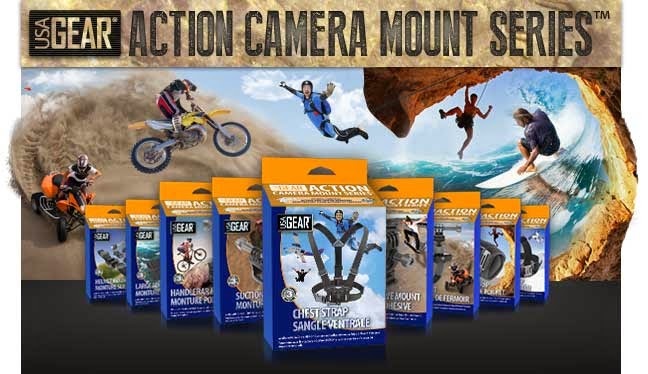 Our USA Gear line has removed these issues and proudly introduces the USA Gear Series of Action Mounts for both action and point and shoot cameras. It’s now only a matter of time until Bigfoot is finally caught on camera! Chest Strap Mount to offer a ‘lower-than-helmet’ point of view. Flat Adhesive Mount to stick directly to flat, smooth surfaces. Suction Cup Mount to capture moving or stationary video and photos. Handlebar Mount to easily take fun photos and videos of trails and trips. Head Strap Mount that can be worn over a helmet, hat or directly on your head. Helmet Mount for vented helmets or smooth surfaces. Large Adhesive Mount which uses 4-point industrial strength adhesive to securely film even in wet situations. Wrist Strap to wear like a watch and take your videos to another level. Zip Strap Mount that easily adjusts like a zip tie for universal filming options. The USA Gear Action Mount Series has a little something for everyone. Not only are these mount affordable, they offer premium, quality construction as evident by the 3-Year Manufacturer’s Warranty that comes with each. Go to www.accessorygenie.com and get yours today!